As the majority of the major markets are closed, the Nikkei yet again took central focus. The Nikkei moved up 60 bps as we saw capital flows move into Japan. The USD/JPY also weakened by 20 bps to 109.73. The Kospi reopened with negligible effect rising 7 bps. The Indian Sensex performed reasonably well this week rising 2.38 %. The YoY for the Sensex is 7.86%. The big performer of the day was the ASX 200, rising 1.1%, which came about after RBA governor expressed concerns about economic risks in the region and signaled a possible rate cut is on the table. NZ seemed to have a knock on affect after rising 70 bps today. The AUS/USD weakened slightly against the USD by 15 bps. Gold increased 39 bps at time of writing, and silver followed suit after rising 26 bps. It wasn’t so rosy in Europe as the markets took quite a tumble, notably the DAX index. The German index lost 2.33% in a single trading session. This occurred on the back of the ECB and the BoE revising growth prospects for the region. The BoE sees possibly the weakest outlook since 2009, and the EU reduced growth expectations from 1.7% to 1.2%. The majority of the major European markets took a tumble; the MIB and the IBEX were notable at 2.6% and a 1.8% decline respectfully. The EUR/USD was less hit by the news as it declined only 5 bps. The GBP/USD, on the other hand, increased 30 bp as it recently went under 1.30. Elsewhere, the Norwegian Central bank has readied real estate as possible holdings within their portfolio. 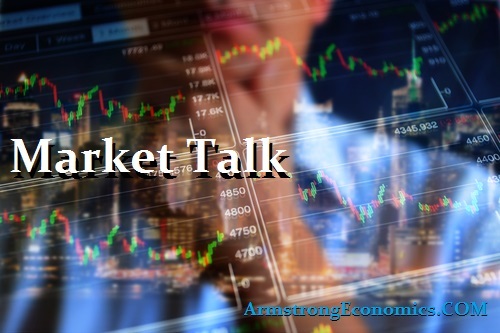 U.S. markets followed Europe on the way down, as U.S. – China trade concerns compounded European Union lowered outlook. “Unlikely,” President Donald Trump said when questioned whether he would meet with Chinese President Xi Jinping to discuss U.S. imposed tariffs before the March 1 deadline, while White House economic advisor Larry Kudlow said “we’ve got a pretty sizable distance to go here” regarding the current state of trade talks. There’s no surprise there was a -220 point drop in the Dow today (25169.53 close, -0.87%), but this was actually up from the intraday lows of the day. But the Dow was not alone – the NASDAQ (7288.35 close, – 86.93 points, -0.18%) and S&P 500 (2706.05 close, -25.56 points, -0.94%), and the Russell 2000 (1505.63 close, -12.40 points, -0.82%) also underperformed this Thursday. Not surprisingly, volatility spiked as with the VIX crossing above 16 again (up over 6%). On the corporate side, there was a notable M&A deal announcement with SunTrust Bank Inc. and BB&T Corp. agreeing on a $66 billion merger that will amount to the sixth-largest U.S. bank based on deposits and assets. The USD/CAD increased by 0.74% today, coming in at 1.3309, which stands as the current February high. Canadian equities were only marginally down across the broad TSX Composite (15,703.36 close, -8.95 points, -0.06%) and the more narrow TSX 60 (937.61 close, -0.46 points, -0.05%). Brazil’s BOVESPA continued its decline as well (94405.59, -229.98 points, -0.24%). Crude and Brent took a tumble. Crude was down -3.6% as of the time of this writing, and the Brent price barely hung on to the 60 dollar level after declining -2.8%. This a day after the U.S. Energy Information Administration’s weekly report, which stated an increase in overall oil stocks while today Libya suggested they could increase production after the military leader seized the country’s largest oil field. Also, Russia formed a pact with the OPEC countries (10 in total) in an attempt to manage the oil market more efficiently. Japan -0.01%(+1bp), US 2’s 2.49% (-4bps), US 10’s 2.67%(-3bps), US 30’s 3.01%(-3bps), Bunds 0.12% (-5bp), France 0.55% (-3bp), Italy 2.96% (+13bp), Turkey 14.35% (+33bp), Greece 4.00% (+10bp), Portugal 1.67% (-0bp), Spain 1.25% (-1bp) and UK Gilts 1.18% (-4bp).